Microbial granules have practical importance in anaerobic and aerobic biological wastewater treatment. Advantages of granules are retention of biomass in reactor, diversity of microorganisms, complex structure, and resistance to unfavorable conditions. Microbial granules can be used to treat municipal and industrial wastewater for removal of organic matter, xenobiotics, nutrients, and heavy metals. 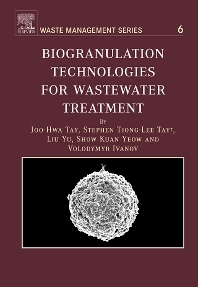 The book covers almost all aspects of formation and use of microbial granules in wastewater treatment. The data on aerobic microbial granulation are related mostly to laboratory systems due to few pilot systems in the world using aerobic microbial granules. However, by the analogy with anaerobic granulation, which is now used worldwide, it is possible to predict wide applications of aerobic granulation. This book will help researchers and engineers develop these new biotechnologies of wastewater treatment based on aerobic granulation. Volodymyr Ivanov is a professor at the School of Civil and Environmental Engineering, Nanyang Technological University, Singapore and his research lines encompass nanobiotechnology and microbiotechnology.